Remember those that support the "Brotherhood" with full size ax plaque or hand ax plaque. 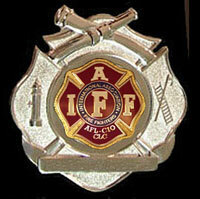 Install the IAFF in the applique at no additional cost. view print - Suggestions for Personalization's - click here. It's Important to remember the inscription is the trigger that will explain to those that see the plaque the reason you presented it. It is appropriate to make it personal. Includes: Includes 39 X 16 walnut plaque, polished aluminum decorative ax, our engraved badge on ax head w/ IAFF logo, eagle helmet front piece holder and "our" shield or space to install "your" helmet shield (we include mounting hardware), 1 décor disc's and personalized 5 X 7 plate with your copy. 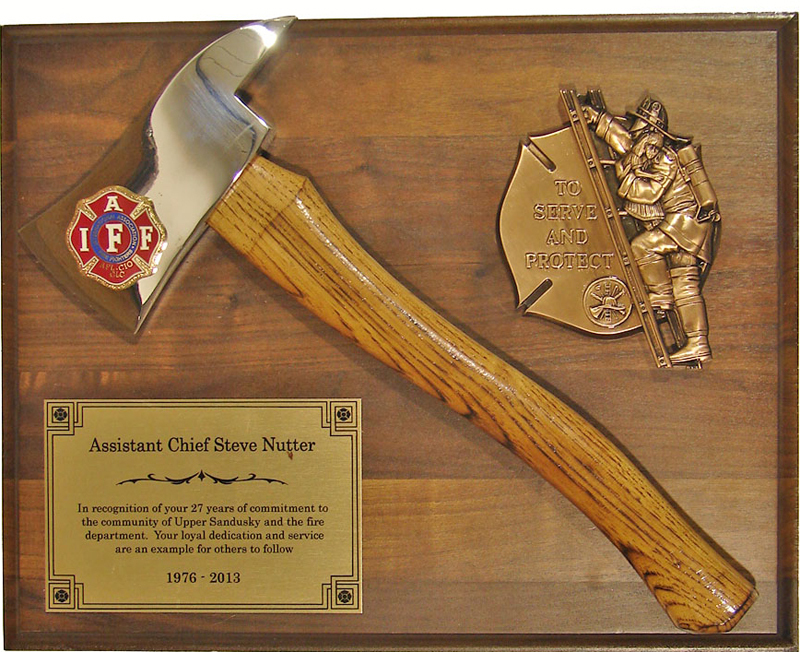 Includes: 39 X 16 walnut plaque, polished aluminum decorative ax, our engraved badge on ax head w/ IAFF logo, metal Bravest mount, 2 décor disc's and personalized 5 X 7 plate. with your copy. 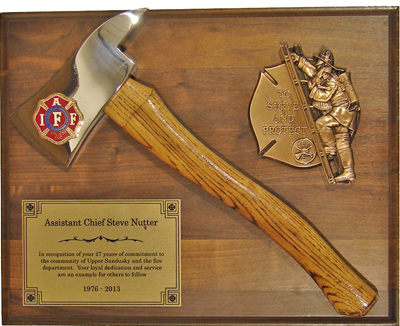 Includes:Includes 39 X 16 walnut plaque, polished aluminum decorative ax, our engraved badge on ax head w/ IAFF logo, metal Serve & Protect mount, 2 décor disc's and personalized 5 X 7 plate. with your copy. 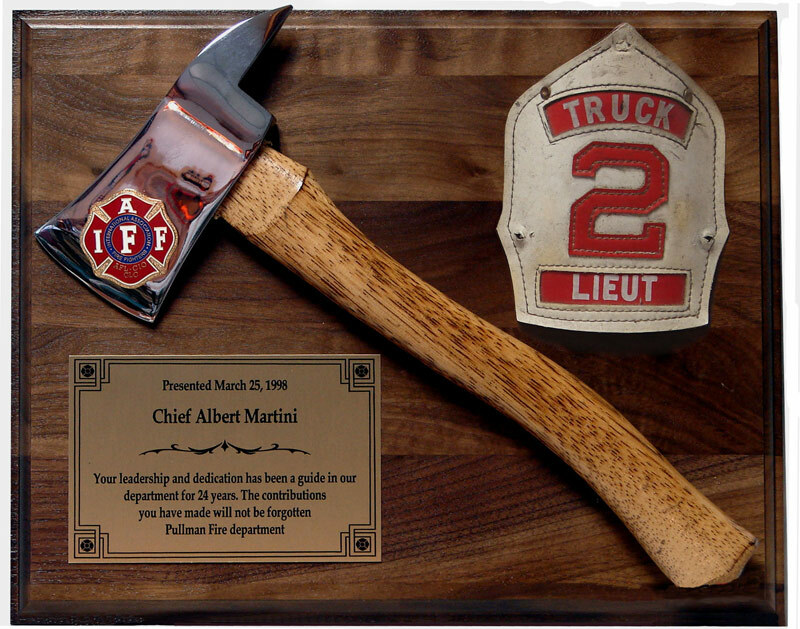 Includes:39 X 16 walnut plaque, polished aluminum decorative ax our engraved badge on ax head w/ IAFF logo, resin Maltese mount, 2 décor disc's and personalized 5 X 7 plate. with your copy. Includes: 39 X 7 walnut plaque, polished aluminum decorative ax our engraved badge on ax head w/ IAFF logo, 2 décor disc's and personalized 2.5 X 6 plate with your copy. Substitute a polished brass ax add $59. 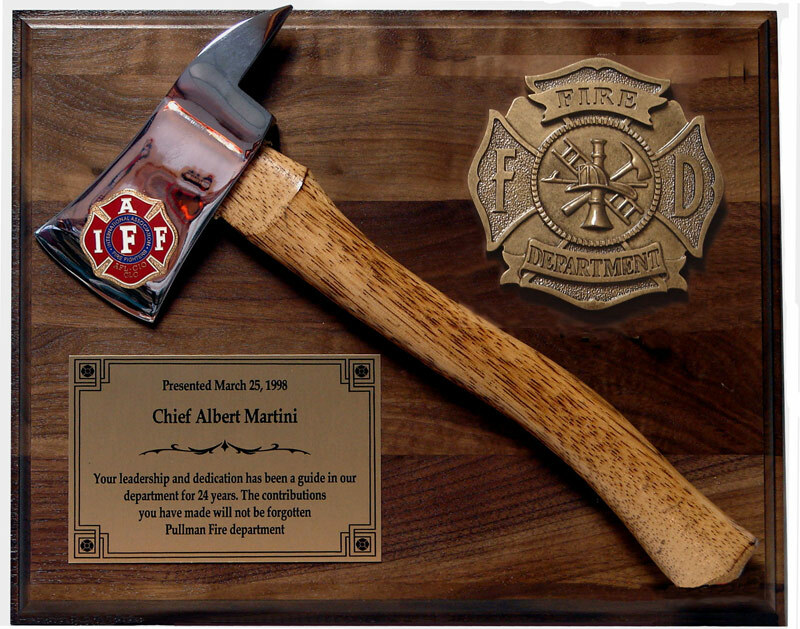 39 X 16 walnut plaque, polished aluminum decorative ax engraved badge on ax head w/ IAFF logo, gold & black wreath with 4" stock FD disc, 2 décor disc's and personalized 5 X 7 plate. with your copy. 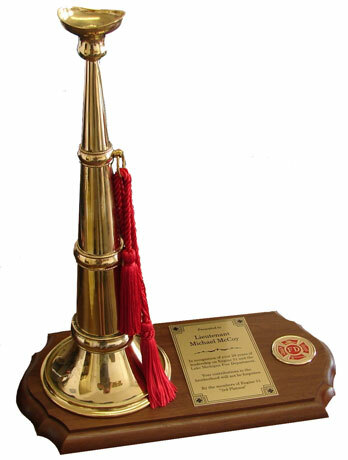 Includes: 10 x 20 walnut plaque with 8" shelf with a 20" tall Brass or nickel plated speaking trumpet w/ red tassel. 4 x 6 personalization plate, decor disc or your dept patch note: as bugles are hand built some minor irregularities may be present. Includes:8 x 16 walnut base. Approx. 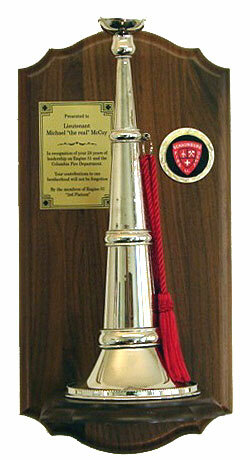 20" tall Brass or nickel plated speaking trumpet w/ red tassel, 4 x 6 personalization plate, decor disc or your dept patch. note: as bugles are hand built some minor imperfections may be present. 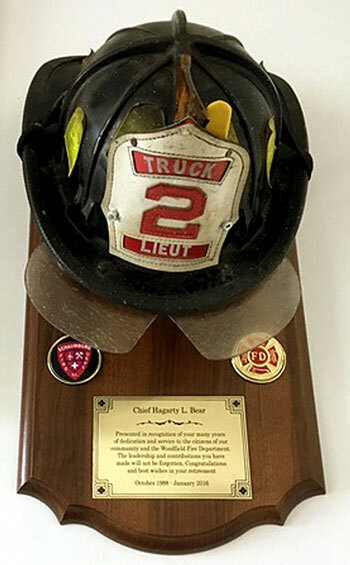 Includes 13 X 15 walnut plaque with hand ax; (in polished brass or chrome) IAFF logo and space to install "your" helmet front piece (we include mounting hardware) and personalized 4 X 6 plate with your copy. Includes 13 X 15 walnut plaque with hand ax; (in polished brass or chrome) includes IAFF logo and resin Maltese Cross mount and personalized 4 X 6 plate with your copy. 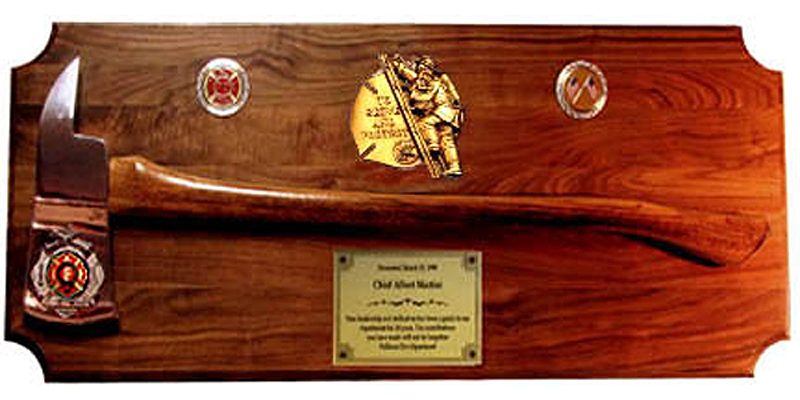 Includes: 13 X 15 walnut plaque with hand ax; (in polished brass or chrome) includes IAFF logo, metal Serve & Protect mount and personalized 4 X 6 plate with your copy. 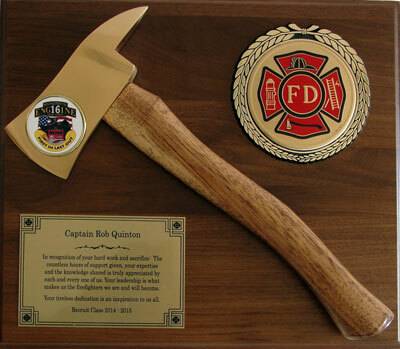 Includes: 13 X 15 walnut plaque with hand ax; (in polished brass or chrome) includes IAFF logo, gold & black wreath; 4" stock FD disc and personalized 4 X 6 plate with your copy. 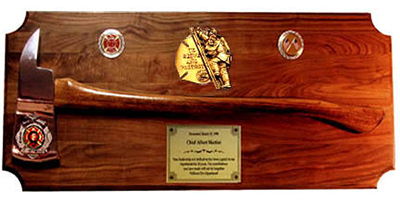 Includes: Our 24 x 12 walnut plaque with walnut display stand and IAFF logo and 1decor disc and 4 x 6 personalization plate. Can be used on a desk or wall mounted.